Chocolate, Chocolate, Chocolate. Need I say more? It's the craving that I can't stop. When it gets in my head, I have to have it. But for me, a chocolate bar does not satisfy this craving. I need a cake, cookie or brownie. Maybe its the carbs mixed with the sugar, but its the only acceptable form of chocolate for me. So when that craving hits, and you're trying to limit those carbs...kind of... it is still the New Year after all... 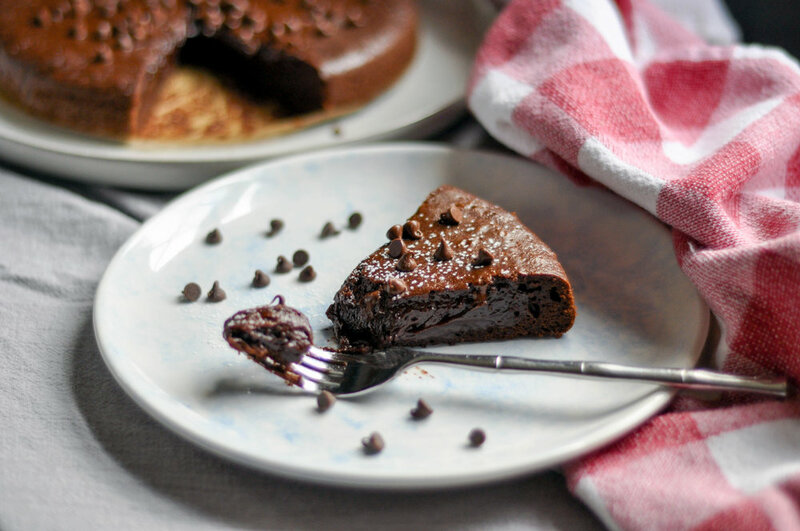 This Gluten Free Chocolate Cake recipe from Maison Kayser is amazing. It's lusciously decadent, gooey, and filled with chocolate. It bakes up almost like a chocolate tart but with a slightly chewy outer edge. So to quote Monica from "Friends"-How can you not... want...some...of... this?